Vestil Mfg. 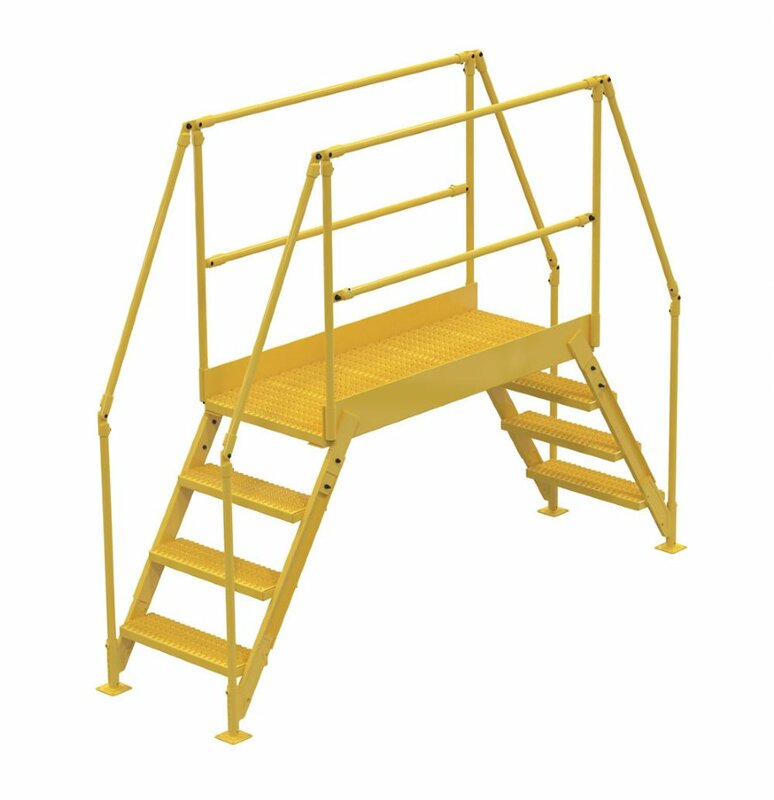 4 Step Cross-over Ladders, 60" L Platform, 56° Angle Steps, Powder Coated Steel, Safety Yellow. Vestil Mfg. 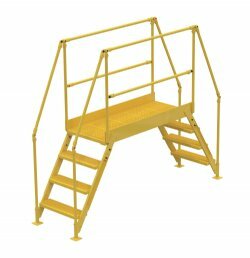 4 Step Cross-Over Ladders with 60" long platform mounts where you need permanent access at crossover points. The upper platform features removable two sided handrail with mid-rail and fixed toe boards to prevent objects from rolling off. Serrated steps for extra grip and safety. Ground legs include floor mounting pads. Unit must be anchored to the floor. Cross-Over Ladder is all welded steel construction but can be knocked-down for storage and shipping. Powder coat yellow finish. COL-3-26-14 3 58° 500 lbs 54-1/2" 29.25" 72-3/4" 30" 24" 24" 28" 14-1/2" 24" 7"
COL-3-26-23 3 58° 500 lbs 66-1/2" 29.25" 72-3/4" 30" 24" 36" 28" 26-1/2" 24" 7"
COL-3-26-33 3 58° 500 lbs 78-1/2" 29.25" 72-3/4" 30" 24" 48" 28" 38-1/2" 24" 7"
COL-3-26-44 3 58° 500 lbs 90-1/2" 29.25" 72-3/4" 30" 24" 60" 28" 50-1/2" 24" 7"
COL-4-36-14 4 58° 500 lbs 67" 29.25" 82-3/4" 40" 24" 24" 38" 14-1/2" 24" 7"
COL-4-36-23 4 58° 500 lbs 79" 29.25" 82-3/4" 40" 24" 36" 38" 26-1/2" 24" 7"
COL-4-36-33 4 58° 500 lbs 91" 29.25" 82-3/4" 40" 24" 48" 38" 38-1/2" 24" 7"
COL-4-36-44 4 58° 500 lbs 103" 29.25" 82-3/4" 40" 24" 60" 38" 50-1/2" 24" 7"
COL-5-46-14 5 58° 500 lbs 79-1/2" 29.25" 92-3/4" 50" 24" 24" 48" 14-1/2" 24" 7"
COL-5-46-23 5 58° 500 lbs 91-1/2" 29.25" 92-3/4" 50" 24" 36" 48" 26-1/2" 24" 7"
COL-5-46-33 5 58° 500 lbs 103-1/2" 29.25" 92-3/4" 50" 24" 48" 48" 38-1/2" 24" 7"
COL-5-46-44 5 58° 500 lbs 115-1/2" 29.25" 92-3/4" 50" 24" 60" 48" 50-1/2" 24" 7"
COL-6-56-14 6 58° 500 lbs 92" 29.25" 102-3/4" 60" 24" 24" 58" 14-1/2" 24" 7"
COL-6-56-23 6 58° 500 lbs 104" 29.25" 102-3/4" 60" 24" 36" 58" 26-1/2" 24" 7"
COL-6-56-33 6 58° 500 lbs 116" 29.25" 102-3/4" 60" 24" 48" 58" 38-1/2" 24" 7"
COL-6-56-44 6 58° 500 lbs 128" 29.25" 102-3/4" 60" 24" 60" 58" 50-1/2" 24" 7"